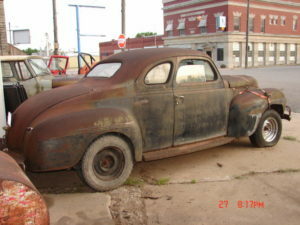 Listing is a classic 1940 Dodge 5 window business coupe mostly complete with rust and moss. 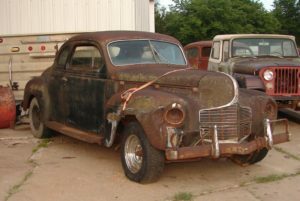 This old coupe sat under trees for years with no front tires so the front suspension is ruined but it will roll to load on a trailer. Outside body is pretty solid with fender bender on right front and classy moss growing here and there. 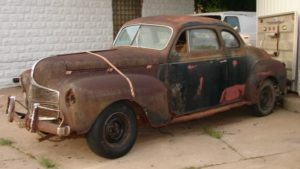 Driver door hinges have serious rust out that will require work, inside door bottoms and driver side floor pan rusted out. 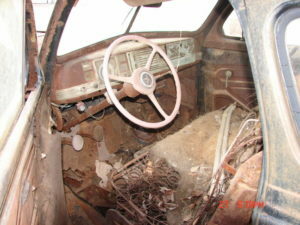 Original drive-train is complete as-is aged interior with business compartments. Best suited for a Rat Rod project.